A Page Is Turned: Sad. We've had a lot going on this week, but it hasn't been too bad. The week has just flown by. I don't know about you, but I'm just sickened about all of the things going on this week in our country. As I type this, there's a manhunt going on for the Boston Marathon bomber (just one, the other was killed). It's all just so, so sad and sickening. And then there was the explosion in West, Texas. Have y'all seen the video of it? Unbelievable. I just cannot imagine living in either city and knowing people involved in either event. Not many pictures from this week but I thought I'd share what I do have anyway! 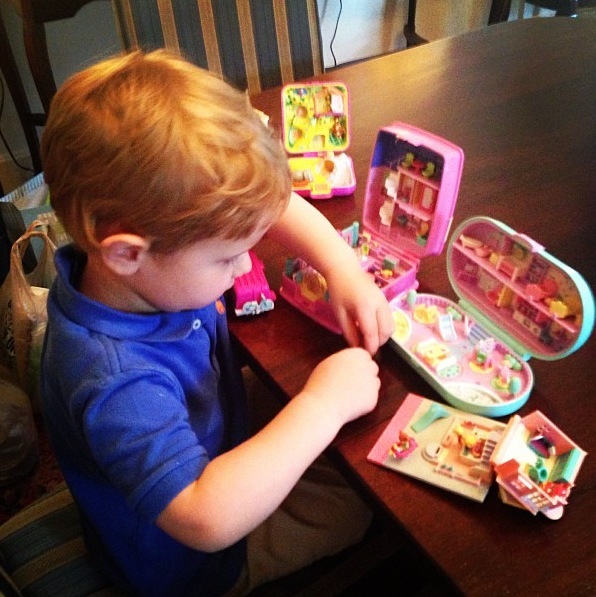 Eddie was dying about this, but James discovered all of Anna's old Polly Pockets at Cacky's on Sunday. He sat and played with them forever! One of our summer goals is to work on writing and sight words. James has absolutely zero interest in coloring and writing, but I was PLEASED and made a huge deal out of him writing this letter the other day. Seriously, ZERO interest in learning to write. But desperately wants to be able to read. I finally finished my wreath from the Pinterest Party a few weeks ago. It's not the best looking thing ever, and I'm certainly not going to be selling any of these, but it's done! Can't wait for our next one! The boys watched Eddie mow on Tuesday night. And yes, the window is that dirty. That's what happens when you have a dog and small children who look at one another through the door. Want to know how excited I was that EVERYONE decided to start the day at around 6:45 yesterday morning? SO excited. Ugh. It wouldn't have been a big deal but we had to be somewhere that pushed naptime back and then they were both up an hour early. Yikes. Long walk with Daddy last night. James gets to run/walk on the cul-de-sacs so he was excited when we got here. This boy. See those squishy thighs? They're ticklish, too. I wish you could see the whole outfit. It's a smocked cow/farmer/tractor scene and he wore it to Eddie's customer appreciation picnic yesterday (Eddie does agra banking so the even was for farmers). Thanks to the Bargerons, Will has an outfit for just about every occasion and unlike with James, I dress Will up in a smocked jon jon almost DAILY. And I LOVE it. Here's hoping for a better weekend for EVERYONE. Now to get this house cleaned up before James gets out of school. That F looks so cute! Here is hoping that this week is much better than last, filled with blessings from the Lord, and a perspective that progress is being made, no matter how slow it may be!